Are Probiotics for Constipation a Good Idea? You may have seen commercials about probiotics for constipation. Usually, however, other constipation treatments, including drugs like laxatives, are almost always mentioned in mainstream sources to provide relief for constipation. Probiotics usually are not considered the first constipation treatments option. Why is that? It’s important to understand that although some probiotics are sold as drugs just like laxatives, probiotics are naturally-occurring phenomena and there's not as much money to be made in telling you to eat sauerkraut! As dietary supplements or as natural parts of food and drink products, probiotics are not meant to treat or cure disease. Only drugs can do that, according to the FDA. But since this site is about being healthy with probiotics, I want you to know that the use of probiotics for constipation is just one of their many health benefits. In general, probiotics work best as preventative agents, not as quick "cures". But keep reading because you may find quick relief with probiotics for constipation! If you haven't read the pages on deciding if you have constipation or what causes constipation, you may want to start with those pages. What Does Research Show About Probiotics for Constipation? As of January 2010, the use of probiotics for constipation was considered to be investigational, meaning that it showed promise, but the required large-scale clinical trials to define which ones and in what amounts had not been completed yet. However, new research is occurring which may change that status. One relatively recent (October, 2012), provisionally-published pilot study (meaning not the gold standard of a large-scale, placebo-controlled, double-blind study) with 20 pregnant women using a product called Ecologic Relief containing 4 billion CFU of a mixture of probiotics showed that the product was effective as a constipation treatment. It increased stool frequency, decreased the sensation of incomplete evacuation, decreased the sensation of an obstruction in with bowel, and decreased straining, abdominal pain and the presence of reflux. EcologicRelief contains B. bifidum W23, B. lactis W52, B. longum W108, L. casei W79, L. plantarum W62 and L. rhamnosus W71 and is made by the Dutch company Winclove. Other probiotics have been studied for constipation, from Bifidobacterium to E. coli Nissle to Lactobacillus and many have shown efficacy. So What Are the Best Probiotics for Constipation? One thing that's important to notice about the research on probiotics is that there wasn't just one particular probiotic species that was able to provide relief for constipation. There were many. This illustrates the concept that it takes a village of microbes to be healthy, and that what works for one person may not work for another because we are all unique individuals. Also, constipation can be a problem along the digestive tract, not just in the colon. Pairing up probiotics with raw foods with fiber, with cultured/probiotic foods and drinks (especially some homemade sauerkraut) and with plenty of water is a winning combination for many occurrences of constipation. Of course if you have any medical condition, be sure to talk this over with your doctor. Nutritional consultations can help you get to the causes of your constipation and provide recommendations to improve your condition and help prevent it from recurring. Pearls IC by Enzymatic Therapy: has four Bifidobacterium and 2 Lactobacillus for a total of 1 billion CFU. 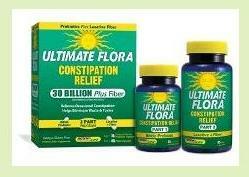 If you prefer to be more aggressive and have a kit to address your constipation problem, Ultimate Flora Constipation Relief 2-Part Kit contains two products: a probiotic supplement with 30 billion CFU of 4 Bifidobacterium strains per capsule, and a combination prebiotic fiber-mineral laxative supplement. This product is labeled gluten free and dairy free. Follow label directions. Remember that straining on the toilet is not healthy for your bowels. If you can't eliminate in a few minutes, get off the toilet, drink some water, do some stretches or massage, and try again later. The Squatty Potty can help with proper positioning on the toilet to make elimination easier and potentially avoid hemorroids. It helps prevent restriction in your colon from regular sitting on the toilet. The Squatty Potty comes in 2 heights: 7" and 9", depending on how tall you are. 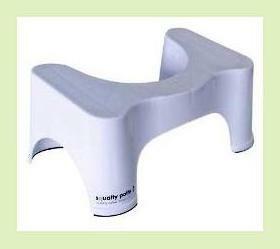 The Squatty Potty website says, "Order the 7" if you are new to squatting. If you are advanced, limber, or have a tall comfort height toilet, get the 9". One reviewer said that if you are over 5'5" tall, get the 7". Return to page on constipation. Return to causes of irregularity.